Make sure to address these, along with insulating the mounts, and you should expect good results. 4 comments to ''Printable Mounts for FSRs"
Thanks for uploading these. I was wondering if you had any pictures of the actual mounting in one of your deltas. Things like do you position them in the 3 axes, or do you place them opposite the towers? Is the bed only attached to the rest of the printer via the 3 silicon pads? If things are setup well, it shouldn't make any difference where the FSRs are located. Although I do prefer to have a probe point right on the FSRs. On the Rostock Max, I do not but it seems to calibrate better than the other machines, so go figure! The bed must be constrained so it can not move in the X-Y plane. It isn't sufficient to just sit it on the silicone pads. On the Rostock, the plunger part is screwed to the bottom of the melamine snowflake so the bed can not move. I have not published the version with the little clip yet, that's coming soon. On a new K250 I'm experimenting with a dab of silicone to hold the bed on! I think it will work great as I did that on my TAZ 4 printer and it has a moving Y. 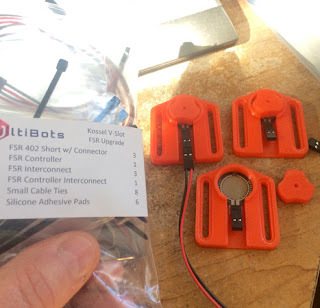 Basically, adhere the FSR to the printed mount. Adhere the silicone pad to the FSR (there is adhesive on the UltiBot pads) and then put a spot of silicone on top of the pads and lower your bed assembly on them. Press a bit to seat and let cure. The only drawback is that it means re-siliconing if you need to remove the bed for some reason. I've thought about using a locator pin arrangement so the bed could separate easily but so far this has not been an issue. Thanks a bunch MHackney! Mounting my bed on the FSR's now! Ok, I've uploaded the alternative mount and hold down for the Kossel 250 and the photo I linked above.